Does size always count? If biggest were best, Australia’s largest wine-growing area, Great Southern, would be much better known than its famous sibling Margaret River, which is just an eighth of its size. However, historically, ‘to be serious and recognised in wine in Western Australia in the 1990s, you needed something in Margaret River’, says Jeff Burch of Howard Park. This, together with Great Southern’s ‘more marginal vintage conditions for Cabernet Sauvignon’, explains why this top producer also makes wine in Margaret River. Leading light Larry Cherubino (Larry Cherubino Wines) laments that Great Southern ‘has been responsible for a lot of Western Australia’s success,but has never been able to leverage its ability to produce some of the best fruit in the state’. Which seems a shame when its ‘very promising potential’ was first spotted by Dr Harold Olmo, visiting professor of viticulture from the University of California, in 1955 – a full decade before Dr John Gladstones’ report did the same for Margaret River. But then Great Southern is Western Australia’s wild west. Even more sparsely populated in the 1950s and still focused on farming and forestry, the region’s first vineyard was not planted until 1965; its first commercial wine, made by Plantagenet, emerged in 1975. However, 60 years after Olmo highlighted Great Southern’s suitability for ‘high-quality light table wines’, and 40 years after the region’s first commercial bottling, Western Australia’s coolest wine region is edging into the limelight. The gifts of nature which supported his conclusion are unchanged: the towering karri forests and lush green pasture which point to good winter rainfall; moderately fertile soils; and, where it borders the chilly Southern Ocean, a temperate climate cool enough to promote slow maturity of the fruit. The vogue for cool-climate styles has certainly boosted listings for Great Southern’s elegant wines. But for Burch, this boost is also due to more ‘small producers focused on quality, recognising the benefits of the region’s climate and different terroirs and collectively making a bigger noise’. Second-generation producer Hunter Smith (Frankland Estate) agrees, and attributes the growth trend to ‘smaller individuals [who] are picking good sites and working in small ways’ as well as a fall in global demand for ‘cheaper, cheerful Oz wine’. This softening demand has also resulted in a quality focused vineyard rationalisation – ‘a lot was planted in the 1990s and a lot has been removed and grafted this decade’, says Cherubino. Cherubino, who was previously at Houghton, and Tony Davies of Snake & Herring (and ex-Howard Park) exemplify this trend. Having made wine for bigger players, they have a bird’s-eye view of the region and the inside track on its most glittering grapes. As for grower/producers, with ‘fruit salad planting’ on the wane, new boutique wineries such as Oakcliffe and Singlefile look beyond their own vineyards – even sub-regions – to secure the best grapes from the best sites for their single-vineyard ranges. This terroir-driven approach has influenced larger players too. Plantagenet’s Cath Oates has ‘focused on the absolute best, in smaller quantities’, while at Howard Park, 10 years of research went into locating its Mount Barrow vineyard. 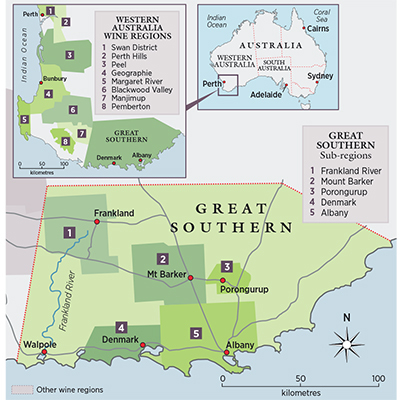 With its large footprint (16,712km squared over five sub-regions) and diverse terroir, Great Southern’s repertoire extends beyond Margaret River’s core red and white Bordeaux and Chardonnay grapes, also encompassing Riesling, Shiraz and Pinot Noir. With higher rainfall, cloud cover and sea breezes, the relatively marginal coastal sub-regions of Albany and Denmark best suit whites and lighter reds, especially Pinot Noir. The drier inland sub-regions of Frankland River, Mount Barker and Porongurup have warmer days but much colder nights; whites and reds are structured and intense. Flatter, warmer and drier than Mount Barker or Porongurup, Frankland River hosts some of the region’s most powerful reds, notably Houghton’s Jack Mann Cabernet Sauvignon from the Justin Vineyard. But, as Smith points out, Great Southern ‘is very site specific’. He should know; Frankland Estate makes some of Australia’s best Rieslings. (See our Australian Riesling panel tasting results). Bone-dry Rieslings – more austere than their South Australian counterparts – have consistently excelled across Great Southern. Now that top sites escape the blenders’ melting pot, Frankland Estate’s terroir-driven, single-site Rieslings have company, especially from Porongurup’s uniquely elevated, granitic outcrop. Also on the rise, more textural, often off-dry Rieslings are naturally fermented and lees-aged in old wood. Deviating even further from the region’s classic lean style, La Violetta’s Das Sakrileg Riesling features a dash of Gewurztraminer. In Denmark, a new breed of flinty, funky Chablis-inspired, early-picked Chardonnays like Castelli’s Il Liris and Singlefile’s The Vivienne offer a point of difference from Margaret River’s muscular wines. Naturally high in acidity, these are ‘Chardonnays for Riesling lovers’, says Castelli winemaker Mike Garland, who sees ‘huge potential’ for sparkling wines. Chardonnays from Porongurup and Howard Park’s neighbouring Mount Barrow vineyard in eastern Mount Barker similarly have great natural acid line. Denmark, Porongurup and Mount Barrow are making great strides with intense, savoury styles of Pinot Noir. For Burgundy’s Pascal Marchand who, with Jeff Burch, makes the Marchand & Burch label, grapes were chosen from Porongurup and eastern Mount Barker ‘because the acidity was finer, the altitude of the sites gave us the cool temperature needed, there was vine age and slower ripening’. Mount Barker and Frankland have long been known for savoury, medium-bodied Shiraz, but a shift towards earlier picking and less extractive Pinot Noir winemaking (whole bunch, older, larger format oak) has reinforced their floral, spicy cool-climate credentials. Albany’s mild, humid climate is generally ill-suited to Shiraz. However, from the Porongurup Range National Park’s eastern end, 30-year-old vines on Kalgan River vineyard’s leanest ironstone gravels lend a distinctively bloody tang to Willoughby Park’s brooding Kalgan Ironrock Shiraz. Where Cherubino feels ‘Great Southern’s quality, diversity and value are just starting to be well understood’, the surge in single-vineyard wines certainly bears out his observation that ‘perhaps it has more to offer than any other region because of its size, varied climates and soils’. What’s more, the trend fits with Olmo’s vision of wines ‘of the highest possible quality’ which he foresaw would be ‘so unique that imitation by other winegrowing districts is impossible’.